You are probably reading this article because you've learned about the discontinuation of Hipchat Server and Data Center and Atlassian's partnership with Slack. With Hipchat going down, the ex-users of the app are in a fix about which collaboration tool to pick next. While some are migrating to Slack, others are looking for better Hipchat Alternatives that can meet their requirements. Slack sure has gained momentum as a team communication tool, and it has excellent features that guarantee secure collaboration. But it limits the context searching feature. Only 10,000 messages are searchable and viewable, and the file sharing is also limited to the total storage space of 5 GB. However, there’s nothing to worry about because there are a lot many collaboration tools with extraordinary features and functionalities available at minimum pricing. Follow this article to find a list of best Hipchat alternatives. We've compiled this list after thorough research, comparison, and user experience tests of the best-rated team collaboration tools. These tools not only have been developed by renowned vendors, but they also have a significant market presence among the businesses operating remotely. Troop Messenger is the best in class, team communication application compact with excellent functionalities that address business needs of both small- and large-scale enterprises. What makes Its a great team chat tool is multiple contemporary features, IP ownership, Data Security, ease of use, and secured and monitored entry etiquette. Features: Instant Messaging, Unlimited Groups, and Group chat, Free Email/Chat Support, Unlimited Message search and History, Face-to-Face interaction, Data record, File Sharing, Screen Sharing, Work Scheduling, and Analytics. Integration: Allows Integration with multiple third-party tools. Storage: Offers storage up to 1 TB for unhindered communication. Supported Platforms: Android, iOS, Linux, Windows, and Mac. Troop Messenger is compatible with Google Chrome, Internet Explorer, Microsoft Edge, and Mozilla Firefox. Pricing: has free and low-cost plans. The basic plan starts at $0 per user/month, and the premium plan starts at $1 per user/month. In general, Troop Messenger's intuitive interface and UI makes the collaboration tool a reliable alternative of Hipchat for team members to collaborate and communicate in a better way. Fleep is a flexible communication tool which can be integrated with email. Fleep offers task management features that allow the members to interact with other fleep users and share files. Integration: Integration with multiple third-party tools like Email, Trello, Fleep API, Dropbox, Google Drive, JIRA, Slack, One Drive, GitHub, and mainstream social networks. Storage: Business subscription have a storage limit of 100 GB. Pricing: $5 per member per month. While several tools boast of extraordinary features, it's hard to compete with Microsoft edge for the robust security it offers for the users. As a part of the 365 packages, this collaboration tool offers a great many features. Users can enjoy private and public conversations with the team members. Features: Online meeting, web conferencing, file collaboration with all Office 365 applications, administrative control, integration with third party tool, and end-to-end data encryption. Integration: MS package, Adobe Creative cloud, Trello, Google Calendar, slack, outlook, Survey Monkey, Wrike, Jira, and Folly. Storage: Allows the storage space of 1 TB per organization, and file upload limit of 15 GB. Supported Platforms: All the major operating systems like iOS, android, windows, JIRA and with all internet browsers like Internet Explorer 11, Microsoft edge, Google Chrome, and Firefox. Pricing: Its free with Office 365 Business Premium and Office 365 Business Essential plans starting at $12.50 per user per month and $5 per user per month. Yammer is all about business networking and collaboration. The tool allows the users to collaborate with team members across geographies, departments, and content to solve problems and share ideas in real time. The tool can be used to share photos, videos, docs in context by adding people in conversations. Integration: One-click integration with Office 365 and multiple third-party tools. Pricing: The premium plan starts at $5 per user per month. Flock is for those who like to keep everything organized and at one place. Fleep can radically modify and improve your collaboration with your team members. Features: Chat during the meeting, Video or audio conference, screen sharing, threading, and content sharing, and Skype for business. Integration: Flock allows Integration with over sixty apps including Google Drive, Dropbox, Twitter, Google Analytics, Trello, and etc. It also gives users the freedom to build their own apps via Flock API. Storage: 10 GB file storage for midsize companies, and 20 GB file storage for large enterprises. Supported Platforms: All the major operating systems like iOS, android, windows. Pricing: Flock has a free-plan for small teams with limited admin control, standard support, and 10 GB file storage. It’s free with Office 365. This open-source communication tool is a business messenger and a private cloud tool that allows the users to meet their company collaboration need. Mattermost works by providing search, integration, and archive of hundreds of business applications to deliver a simplex workplace interaction solution. Features: The tool offers an extensive list of features including push notifications, file sharing, communication management, unlimited search history, Audio/video conferencing, authentication & security, Multi-factor authentication, and Open source & private cloud-ready. Integration: One-click integration with hundreds of pre-built integrations, third-party apps, and company tools. Supported Platforms: Android, Windows, and iOS, Linux, macOS, and Mattermost Server. Bitrix24 offers a highly secure collaboration solution for both small- and large-scale business. It makes for a well-protected data repository where team members can share files, sync them, and collaborate on the on-going projects. Features: Calendar system, email marketing, Marketing automation Integration, Segmentation, Chat, Discussion threads, push notifications, video conferencing, file sharing, task management, discussion boards, brainstorming, and document management, and CRM management. Integration: Integration with a broad range of third-party tools including CRM, Accounting, Project Management, and Business process tools. Supported Platforms: Cloud, SaaS, Web, Mac, Windows, Android Native, iOS Native. Discord and Hipcat are very much similar since both are collaboration tools with the same interface. Discord is also an excellent place for a gaming community where one can look out for people with similar gaming interest. Though the prime concern of this tool is the voice chat features. It allows the users to join the ongoing conversations and posts by joining specific servers. Features: Voice communication, file upload, push to talk, instant messaging, display sharing, and video conferencing up to eight users in the free plan. Users can connect with 5000+ online concurrent members. Integration: API integration of social media apps, games, and other third-party services. Storage: Unlimited storage with a file upload limit of 8 MB in the free plan, and 50 MB in Nitro plan. Pricing: Nitro Classic plan starts at $4.99 per month, and the Discord Nitro plan starts at $9.99 per month, per user. Are your team members working remotely? Do you need the cheapest medium to collaborate with your employees and team members? If yes, Google Hangouts can be a great tool for team communication. Besides sending text messages, video, audio call, this Google app also allows the users to share images. It has other exciting features for personal and business usage. Features: The tool offers screen sharing options, instant messaging, auto screen focus, voice calls, custom administrative control, hangout on air, and HD group conferencing for a maximum of 15 people. Integration: It allows integration with all Google applications like Google Drive, Google Docs, Maps, etc. Storage: The G Suite user can store up to 30 GB of media and text content. Supported Platforms: Android, iOS, Linux, Windows, and Mac, and Web-based. Pricing: Hangout is available for free for making calls, video conferencing, and other features. This office chat software provides a virtual workspace where businesses and virtual teams can organize and manage ongoing projects through real-time chat and workflow streamlining. It enables the enterprises, team, and departments to accomplish business goals efficiently. Features: File sync and sharing, push notifications, direct messages, to-do-list, live-video conference, data encryption, and project tracking with detailed productivity reports. Integration: Integration with API, native apps, emails, and productivity tools like Okta, Hub staff, and Zapier, Google Drive, Dropbox, Evernote, and Slack. Storage: Storage capacity of 5 GB for paid users. Pricing: Redbooth pro and business plan of $9 and $15 per user per month. This open-source business communication solution makes it possible for colleagues to collaborate virtually. It allows the user to avail asynchronous team chat, share ideas, discuss an on-going project with the real-time document and file transfer. Features: Screen sharing, Free video, and audio call guess access, E2E security, two-factor authentication, Live Meeting, Group Sync, and real-time translation. Integration: The tool allows outgoing and incoming Webhook Integration and plugins with popular tools. There are Powerful APIs like Real time API, Live Chat API, and Rest API which make collaboration simpler. Storage: The Bronze and Silver plan allows the storage limit of 1TB and 5TB, and the Gold plan has a storage capacity of 20TB. Supported Platforms: You can download Rocket Chat on Android, iOS, Linux, Windows, and Mac. Pricing: Rocket Chat’s Bronze and the Silver plan start at $2 and $4 per user monthly. For Businesses requiring high-level management, scalability, and unlimited features, the tool has a Gold Plan available at a Volume discount and Tiered pricing. Circuit enhances the efficiency of teamwork through a great many collaborative features like content management, discussion boards, brainstorming, and document management. The tools also have multiple functionalities that facilitate team communication. Features: Chat, Discussion threads, push notifications, video conferencing, content management, discussion boards, brainstorming, and document management. 24/7 Help and Support. Integration: Integration with a broad range of API, and workflow apps like Google Drive and Syncplicity, and Box. Storage: Storage limit of 5 GB for paid users. Supported Platforms: iOS, Android, and Windows. Pricing: Team plan and professional plan starting at $3.95 and $6.95 per month per user. Wimi makes for a standard all-in-one collaboration tool built to make teams work efficiently and effectively. A great variety of features allows remotely working business teams to integrate many services, increase teamwork productivity, and save time. Features: File sync and document sharing, private messaging, business chat, project management through project progress update, drag and drop interface, automatic reminders and notifications, To-do-list, live-video conference, group calendars, data encryption, Gantt chart, and Wimi Drive. Integration: Entire Office 365 tools and Google apps integration, and 20+ service integration. Storage: Storage capacity of 250 GB for the team plan, and 500 GB for enterprise plan. Pricing: There is a free plan that allows collaboration of a team of three members. If you have a larger team, there is team and enterprise plan of $15 and $18 monthly per user. 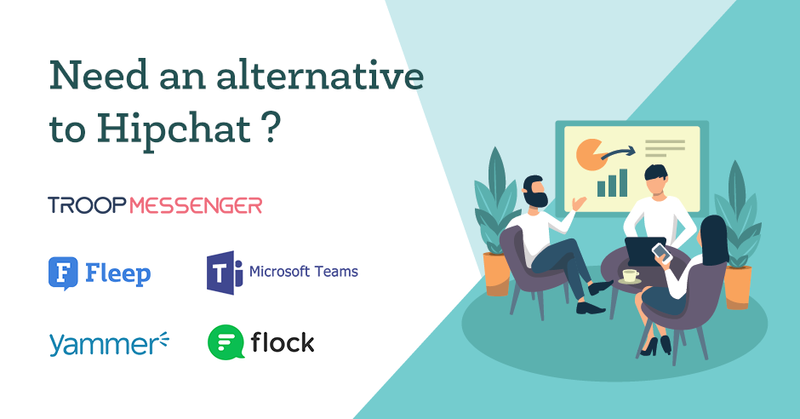 While the extensive varieties of collaboration tools may seem daunting, we spent considerable time to shortlist the best HipChat Alternatives for your business needs and necessities. Not only do these tools have the same functionalities as HipChat, but they also have a better inventory of team chat features that can drive your company’s productivity to new heights. If you are still confused about which tool to use for business communication, allow us to help you filter the best. If you are an MS Office 365 member, we recommend Microsoft teams for robust security and distinct collaboration features. But you'll have to compromise with few limitations of the tool. For instance, it doesn't allow a unified search for the conversations, the structure of files can be confusing, and permission setting can be somewhat daunting. If your organization likes to collaborate the practical way (and you want to save money on expensive paid plans), Troop messenger might be the perfect HipChat Alternative. What makes Troop an excellent team communication and collaboration tool is multiple contemporary features including unified searches, easy organization of files, IP ownership, Data Security, ease of use, and secured and monitored entry etiquette.